Opened on October 21, 2015, the Goodyear day spa is our third day spa in the Phoenix, AZ area. Only minutes from Rt. 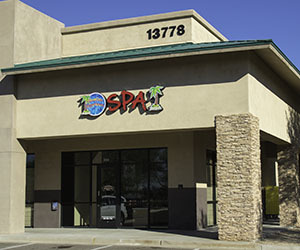 I-10 and Rt.101, the new Goodyear day spa is in a convenient location to anyone in the west Phoenix valley area, including Avondale, Buckeye, etc. Our two existing day spas are rated the top day spas in their cities and the Goodyear day spa will be run to the same standards. See Reviews of Hawaiian Experience Spa’s other locations. -Your staff is NEVER on their cell phones – I NEVER see staff loitering up front making banter with each other. It bothers me at other places to see staff on cell phones or talking to each other standing around but I just became tolerant of it. I have NEVER EVER seen a staff member on a cell phone nor standing around chit-chatting! I feel like your staff is only there to help me and focused on my needs and not their personal social welfare. Wow! On point with your training on this one! “Great atmosphere!” Andrea M., Goodyear.